The game launched Wednesday and by Friday it was purchased, downloaded and installed. I saw this loading screen and then I blacked out in game marathon gloriousness that lasted all weekend. I love BioWare's Dragon Age franchise. I've played each game in the series-- twice, in one case. While I've played the previous game installments on the XBOX360, I've heard repeatedly that "games just look better on the PC". Despite this, I didn't think it would be worth it to trade in my comfy couch and controller for sitting at desk with a keyboard and mouse after working all day in mostly the same position. I was wrong. It looks awesome. I took a few decent-resolution screen shots whenever I thought "Wow, this game looks amazing!" (click on the images below to zoom in). Embarrassingly enough, the rest of these pictures were taken with my phone. Without further ado, may I introduce Mocha the Mage! A female Dalish Elf in my standard Philippine princess build, with purple eyes to boot. I love her. Getting started in the PC version there were a few weird quirks, like the default mesh setting causing everyone to look as if they were made out of shiny plastic. After a few adjustments (and a few crashes), I was off and playing my style of OCD-completionist-gaming where I pick up every single thing along the way. I resurfaced for food many hours later and when I came back, I wanted to play through the opening sequence without the weird mesh glitch. So I decided to make a new character-- this time a male human rogue who I've named "Mr Smolder". Mm, pretty boy goodness. Armor. In the most recent Dragon Age II, the player was unable to customize armor for their companion characters. I found that fairly frustrating, and I like to see different armor designs and styles on characters. 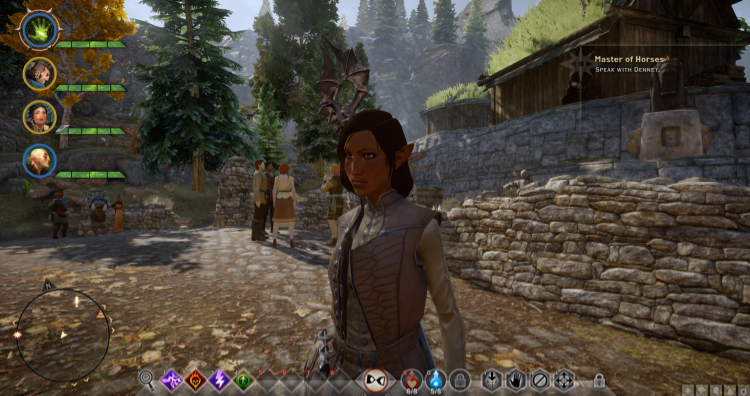 However, in Dragon Age Inquisition, I'm able to change the look & feel of each character again. Wonderful! I also admit I've been known to wear sub-par armor if it looks just that much cooler than the armor with superior stats. Mounts & Fast Travel. Whether you're lazy and want to zip everywhere quickly (not including loading times, but I'm sure that will improve), or you want to gallop through the countryside on the back of a majestic Halla, DAI has you covered. I love this feature. I use both-- one to quickly return to the War Room, the other to traverse the map. (I just wish I could collect loot/herbs without having to dismount but I know that's being super-picky). Collectables & Open World. DAI reminds me a lot of Dragon's Dogma & The Witcher in the style of gameplay-- beautiful visual design elements, fairly open world exploration, with a strong plot line & storytelling. Add to that a healthy amount of animated cut scenes and the War Room map & specialty task force strategy concept I'm one happy camper. I would make the obvious comparison to Skyrim, but I don't think that's fair since I believe Skyrim is in a class of its own when it comes to open world exploration at the time of the game release. 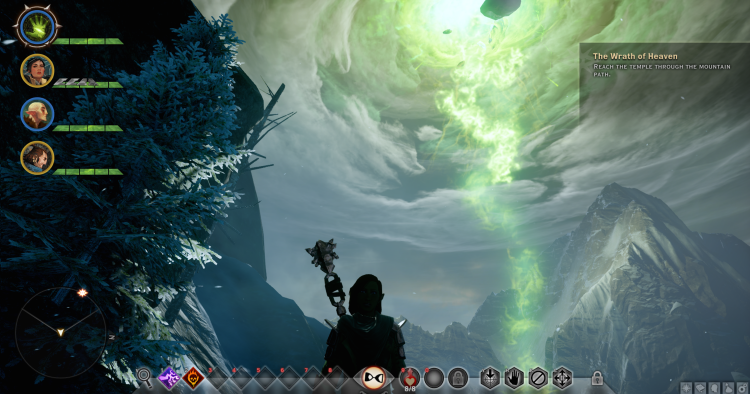 In the past, Dragon Age has been known to be linear, and while I appreciate the fairly clear direction in the storyline, I love to explore. In DAI, there are plenty of crafting supplies to collect, and for someone who picked every tuft of Tundra Cotton and Blue Mountain Flower in Skyrim, I can really dig that. Streamlined Tactics & Stats. In Dragon Age II, I enjoyed micromanaging the companions' controlled actions and their stats. When I went to customize companion behaviors (aka "Tactics") in DAI, I was somewhat disappointed. For each ability, there are only options for "Disabled", "Enabled", and "Preferred". I understand that this approach streamlines the game for most players and makes it accessible for all. Also, at this point, I'm unable to customize the Stats (Ex: Strength, Dexterity, Willpower, etc) of players as they level up. I notice that these perks are built into armor & weapons that one would equip to characters (i.e. Staff of Lightning +3 Willpower), but I'm used to more control as the characters level up. I do acknowledge the positive change in new characters starting ability trees from scratch-- that's great! I never liked adding a character to my party only to find they've been matched to my level with auto-selected ability trees. All in all, I'm trusting the game designers in the decision to streamline the Stats and incorporate it into the armor & weapon selections. However, I'd definitely like more control over the Tactics. Crystal collection. This is a love/hate thing for me. I have flashbacks to the anime Inuyasha when I think of the Shikon Jewel shards being scattered across the land. There were a good 50+ episodes where they hunted these down and defeated demons who had preyed upon the abnormal powers of the shards. The perfectionist in me wants to gather all of them, but I find I'm spending far too much time running all over the countryside to collect them. So distracting! Why am I even doing this again? I'm sure it has something to do with the key to what happened in the Conclave & I'm sure it's somewhere in my Codex. If it is optional, I may leave that for the second play-through since I'd like to progress the storyline sometime in the next year. Valuables. It's petty, but I'm highly annoyed by the concept of moving sell loot/trash into the "Valuables" section of my inventory in order to sell it. I do believe the research items belong in the Valuables section. However, the trash does not. I'd appreciate a separate Trash or Junk section for the sell loot like in previous game versions. Other than that, I'm just glad they distinguish them visually so I double check them before I sell items individually. (Hint: never "Sell All" before visually separating them. Research = yellow background. Sell loot = blue background). Again, it's a minor complaint when compared to the rest of this beautiful game. I love this game. In fact, I'm going to go play it again now. I'll paint at some point but right now I'm going to get lost in some DAI gloriousness. Get ready!